So Thursday morning I’m going to wake up earlier than I want to and board a flight to the rest of my life. A year later I found myself teaching what little I knew about the Bible to others who knew even less… for me, it just came naturally. I had to tell what I was learning… Something compelled me. And I suppose it was way back then – my senior year of high school – that I knew deep down inside that I wanted the major emphasis of my life (other than family, of course) to be teaching the Bible to others. So I went and got my degree in Biblical Studies and Theology, and a couple of years later I got my chance to start teaching Bible to small groups. A couple more years went by, and I started teaching through this blog. And somewhere along the way, when I was knee deep in toddlers no doubt, my heart began to desire a broader ministry. When my daughters were both under 5 years old, my desire to help people become passionate about the Bible grew stronger and stronger… and, logically, the more people I could influence to that end the better. But my call to care for my littles 24/7 was more important to me (and, evidently, to God, seeing as how that’s the way it turned out) at that time. My dream to teach more people more often would have to wait. And that was okay. My time with my pre-school daughters was precious and valuable (and stressful and overwhelming, but I digress). Every one of those summers with my babies I longed to go to the She Speaks conference… I’d scroll through the pretty website, read over the schedule, daydream about the workshops designed to help women like me become speakers – Bible teachers to the masses. And my dream would get a little bigger, threatening to cause my heart to burst with enthusiasm. But every summer would come and go without my being able to attend. Well, my baby turned 5 years old last week. Both my daughters will be in full-time, big kid, real deal school in t-24 days (but who’s counting? )… and the Lord just so happened to move a mountain to send me to the conference this summer. And when I take my eyes off Him, I’m terrified as to what that something might be. But when I remember that He is good and that He loves me, my heart quivers a little less. Today our guest pastor preached on God being sufficient to supply all the resources we need to accomplish the God-sized dreams He’s given us. I share all this to make you smile. He is in every detail. I became a Christian through a long process that culminated in November, 1999. Once I decided that Jesus was really who He claimed to be – the One True God and the only Savior that could make amends for my failures – I thought it would be good if I read His book. But I didn’t have a Bible. 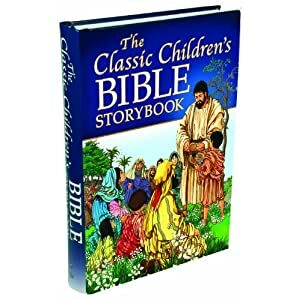 Actually, I had a Children’s Bible my Catholic grandma had sent me when I was a child. It was a thick volume with creepy, old-fashioned pictures, and we never read it. It lived on the shelf of my closet my entire childhood. After I became a Christian, I dug it out, opened it, and considered reading it. But I felt silly, being 16 years old and reading a children’s Bible. I didn’t have a job (read: money) or a car, so I wasn’t sure how I could get my hands on a real Bible. And I was too embarrassed/fearful to ask my parents for assistance. I just wasn’t sure how they’d react to my interest in the Bible. We never talked about religious things, and I assumed it would be an uncomfortable conversation if I asked them for a Bible. But God wanted me to have one. I saved my allowance and asked my mom to take me to the bookstore so I could do some Christmas shopping. While she was looking around, I snuck away to find the Bibles. I stared at a WALL of books, all Bibles, and had NO idea how to determine which would be best for me. I took a look inside a few of them and, ultimately, selected a cheap, readable Bible. I took it to the cashier as fast as possible and never made eye contact with her as I handed her exact change. I hoped my mom, being under the impression I had bought a Christmas gift for someone, wouldn’t ask me what I bought. And she didn’t. When I got home, I went to my room and opened the bag. I pulled out the Bible, opened it, and stared at the pages. What were these strange notations? Why was each sentence numbered? I read the tag, “Psalm 32:2”. What was that colon about? I didn’t understand. I felt like I was looking at a foreign language. I flipped back to the “Introduction” and read every single word, hoping I’d find instructions on how to read this book. Thankfully, it explained that each book was divided into chapters (the big numbers, as it were), and the chapters were divided into verses (the small numbers, it turned out). Feeling more informed about how to use the book, I decided to start reading it from the beginning. Genesis began to explain to me how the earth and everything in it was formed. It didn’t sound like anything I’d ever heard before. I had never even heard of Intelligent Design or Creationism. My science-loving dad had never spoken of this, not even as a mere possibility. Whenever he taught me things about the universe and space and humanity, he explained things from an evolutionary stand point. And I had always taken his word as truth because he was my dad. His authority was all I ever needed as a child to believe what he was saying. Similarly, the public schools I had attended my whole life had failed to mention there was more than one theory out there about the origin of the world. But my teachers were my teachers, so I had trusted that they were teaching fact and truth. As I sat and read this alternate idea as to how the universe was made and how people were created, I was fascinated. I knew it was true. In a similar way to how I just knew Jesus was God/Savior one day, I trusted this book without any need to verify its truth. I read it most days, eager to learn what it had to say, but often not understanding the significance of what I was reading. And that was ok in the beginning. I was learning. And you have to learn before you can question. I was 16 when I relied on God for the first time. It was more like I threatened God, telling Him that it was His responsibility to get me through this painful thing called life. And He took me up on the challenge. I began my junior year of high school with a broken heart and a downcast spirit. I can’t say why some of my classmates chose to befriend me in that state, but they did. They didn’t talk to me about Jesus or church, they just took the time to chat with me about school, music, and soccer. And soon I found myself with a handful of new friends. I hadn’t considered whether or not they were Christians; I just wanted some friends and enjoyed talking to them. One October night one of those friends, Chris, invited me to go to a concert (Fuel and The Nixons, for those of you who like details) with a group of his friends. I jumped at the chance, excited for the show and the social interaction. I ended up in a car with some “random” kids. I knew them from school, but we hadn’t ever had a conversation. We had a great time at the concert, and on the way home, I was the last person to be dropped off. I barely knew the guy driving, Tyler, but we pushed through some small talk. As I was getting out of the car, I thanked him for the ride. And then God nudged Tyler’s heart, and he extended an invitation to me. I told him I’d think about it (yeah, right). I just wasn’t ready to awkwardly work my way into a group of friends that had known each other for years. I wasn’t confident in my social skills anyway, and the thought of showing up at this guy’s house BY MYSELF turned my stomach upside down. I was scared. And felt socially paralyzed. But it wasn’t the worst experience of my life. There were probably 12 kids there and a couple of “random” adults. I have no recollection of what we talked about – some non-threatening topic like stress, parents, or school. And then we broke up into groups of 3 to talk some more. (Actually, I didn’t talk at all. I went to that group every week for two months before I ever voluntarily spoke up). I watched him draw. I listened to him explain the Gospel as he wrote. I felt nervous. Then Wayne asked me, “Do you believe Jesus died on the cross for your sins?” I said yes. I think I surprised him. I know I surprised me. Honestly, part of the reason I said yes was because I wanted to please Chris and Wayne and not embarrass myself by being the only person in that house that didn’t believe in Jesus. But that was only part of it. The other part of it was that for some reason, I felt like what Wayne was describing was true. It was all brand new to me, but there was a surreal comfort in it. I had never heard the Gospel at all. I didn’t know anything about Jesus, the history of His life, the significance of His death, or that He had supposedly risen. I hadn’t verified any of the things Wayne was talking about, but I believed what he was saying. That November night, I trusted Jesus to be my Lord and Savior. And that was the step in the right direction I needed to take to begin to experience heart change. I was not raised in a Christian home. My parents were both raised Catholic, but neither practiced that religion once they became adults. In fact, they raised my brother and me without any religious influence whatsoever. They wanted us to choose for ourselves what religion, if any, we’d subscribe to. As a military family, we moved around the world throughout my childhood. When I was 12, we moved to San Ramon, California. Less than a year later, my dad became a Fed Ex pilot, and my parents had to choose our next home: Anchorage, Alaska, or Memphis, Tennessee. I fully believe God led them to choose Memphis, without their knowing it, because He had a plan for my salvation that incorporated many key people in the Memphis area. We moved to a suburb of Memphis just in time for my eighth grade year. Again, my parents had to choose which school district they wanted me in – Houston or Collierville – and, again, the Lord was working behind the scenes. I wound up in the Collierville school system. Because I attended 3 different middle schools in 3 years, I was quite ahead of the curve in math. I was an honor student in all subjects, but I was even more advanced in math. Decision time – do I skip eighth grade and begin high school, where they offer the math course I need, or do I attend eighth grade as scheduled and supplement my math class in an unorthodox way? Although none of us knew it at the time, this decision was crucial to my salvation. Most of the students who would later expose me to Jesus were in the eighth grade that year. So God made sure I was too. With no education in the way of religion, the eighth grade me was confused by all the churches in Memphis. I had never lived anywhere else in the world where church attendance was such a central part of life. I could literally count on one hand the number of friends I had in my first thirteen years of life that attended church of any kind. Couple this oddity with my jadedness from all the moving, and I just wanted to rebel against and reject people in Memphis before they had the chance to reject me. As a result, I decided I needed to reject their God, even though I knew nothing about Him. I began to argue with kids at school about why Christianity was stupid, and how they had no basis for their beliefs, and how all beliefs are equally possible, which meant I wasn’t going to subscribe to one belief – the odds of me choosing the right one were minimal. I didn’t like those odds, so I chose not to choose, which, it turns out, is a choice in and of itself. I chose not to believe in anything. When I was in ninth grade, I continued my quest against Christianity. But even though my heart was hard, God decided to show His power to me. One of the senior guys at school was in a rock band, and they were having a concert. I wanted to go because I thought he was cute. My first clue that something Jesusy was going to happen should have been that the concert was at a church. But that didn’t register with me at all. This guy didn’t look like the Christians at my school – he had skater jeans and a blue mohawk. I guess I just figured they let people use the church like a community center, and the band somehow was allowed to have their concert there. There were about 100 kids from school at this concert. Everything was going fine until halfway through the band’s set. They dimmed the stage lights and went from playing high energy rock to an acoustic worship set. I didn’t know what was going on, but the guy singing had his eyes closed the whole time, and the kids around me – kids I knew – were singing to God with arms raised. It was all very strange to me. And as I tried to process what was happening, I decided that God was happening. God was affecting people. I left that concert that night thinking, “If God can affect this many people, He’s got to be real.” And that was a giant step in the right direction.